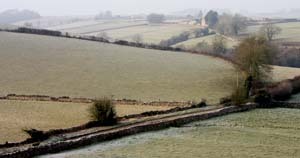 Route: The route mostly follows country roads, the Cotswold Way and paths across cultivated fields. Most of the route is clearly waymarked. From Marshfield, follow George Lane, which runs north from High Street through the village at its western end. Cross the busy A420 and continue to follow George Lane until you reach Castle Farm. At the cross roads, follow the footpath indicated by the sign on a wooden pole, through a gate and across a field. The field slopes down to a gate at the northern corner. Turn left on to West Littleton Road. Follow the road up to West Littleton village. Walk through the village until you see a red telephone box on the right. Turn left onto the footpath opposite the 'phone box, through iron gates into the church yard. 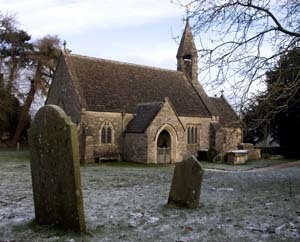 Walk past the church and cross over a stone stile at the far end of the graveyard. Continue ahead, between trees on the left and a fence on the right, to a wooden gate into a field. Cross the field and leave by a wider, wooden gate. Almost immediately climb a ladder stile and continue in the same direction, with the field boundary on your left. Leave the field via a stile, cross a track, to enter the next field by climbing another stile. It was winter when we followed this walk, with this and the next two fields freshly ploughed - how clear the paths will be when there are crops growing is impossible to say. The field slopes down gently to a small, makeshift bridge across a stream or drainage ditch. The path then continues up to stone stile and marker post. The path across the next field was unclear, so we followed the field boundary on our left, then turned right at the top corner. There was no stile or gate to exit this field, just a gap in the hedge, opposite a sign post by the road across the third and final ploughed field. Cross this field to exit by the footpath sign. 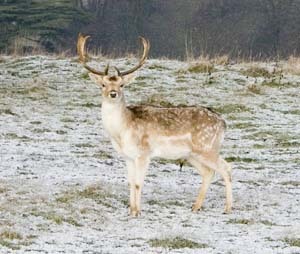 ... but we were still rewarded with a close view of some deer! 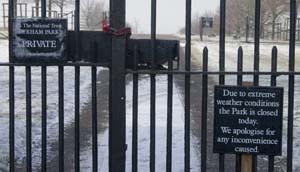 We continued along the park boundary and through a wooden gate. Where a track crosses the path, keep straight on to a stile. Cross over the stile and turn right on to a minor road. Continue down the road, past a service vehicle exit road from Dyram Park (on right) and private road to Sands Farm (on left). Follow Cotswold Way signs to take a footpath on left (maybe pause for a rest on the bench). Proceed through a series of fields and kissing gates until you cross a stream below Dyram Wood. The next section is the steepest, longest uphill section of the walk. Continue walking with the field boundary on you left. Walk past a gate, and enter the wood through a wooden stile at the top corner of the field. Proceed up through the wood, and then follow Cotswold Way signs until you reach Gorse Lane. Cross the road and take the path opposite. This follows the road to the left, then turns sharp right. The path keeps close to the field boundary, then becomes a narrow lane, leading to Pennsylvania, and our second disappointment! Our 2003 version of the OS map showed a pub here - alas - no longer! 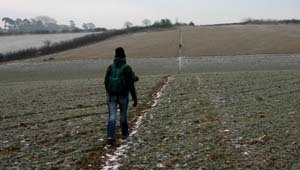 We carried on, crossing two fields diagonally to emerge at Folly. What a pleasant, unexpected sight when we turned left onto the A420 - a pub! Not marked this close on our map! 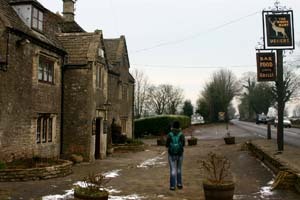 After warming up with suitable refreshment at the White Hart, we crossed the road, and followed the Cotswold Way signs to Cold Ashton, passing through the church yard, before emerging on Hyde's Lane. Turn left along the road, and take the second footpath signposted off the road on the right. Follow the path down through a valley, below small woods. At a junction of paths, turn left, gradually getting closer to the stream. The path (not always clear) continues in the same direction, along the valley bottom, to emerge on Green Lane. Turn left and follow the Lane until it turns to the left. Take the footpath ahead to the outskirts of Marshfield. Turn left along the minor road, which brings you back to the main road through the village.